Obituary – Sloan, Beverly June (McQuiston) « Perry High School Alumni Association, Inc.
﻿Y—Teens 47-48, F.T.A. 48-49, National Junior Honor Society 46-47, National Junior Honor Society Vice—President 46-47, National Senior Honor Society 49-50, National Senior Honor Society Secretary — Treasurer 49-50, Red Hots 47-50, Red Hot Secretary 48-49, Red Hot President 49-50, Perryscope Staff 49-50, Home Room President 46-47, Home Room Secretary 47-48, Junior Play 48-49, Girls State 49, Student Council 48-50, Student Council Secretary 49-50, Girls Trio 49-50, Glee Club 49-50. 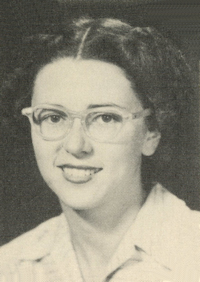 Beverly June McQuiston Sloan, age 72, was born April 24, 1932 in Perry, OK to Keith & Kathryn (Laird) McQuiston. She passed away March 8, 2005, at her home at Spanish Cove in Yukon, OK.
Beverly graduated from Perry High School and attended Oklahoma A&M (now OSU) and later the University of Oklahoma. She married Wilbur Sloan on January 24, 1953 in Perry, OK. While her children were growing up she was active in Camp Fire, Cub Scouts, PTA and Band Boosters. She worked in the clerical field for many years and later opened her own florist business. She was certified as an Oklahoma Master Florist and served as a Regional Director for the Oklahoma State Florist Association. After her retirement she and Wilbur moved to Lake Kiowa, TX, where she was active in the Women’s Associations, the Ladies Golf Association and the First Presbyterian Church. In 2000 they moved to Spanish Cove in Yukon. 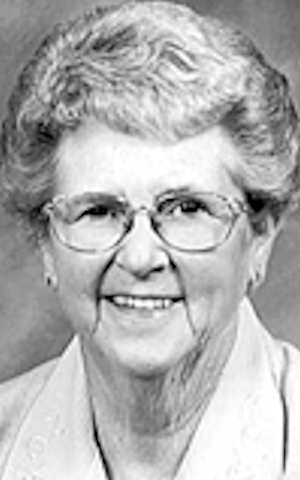 She always enjoyed arts & crafts and her hobbies included reading, flower arranging, quilting and stained glass. While living in Yukon she established a book discussion group at the Mabel Fry Library, was a member of the Yukon Ladies Library Club and was serving currently as an Elder in Chisholm Trail Presbyterian Church. She was preceded in death by her parents and a grandson. Beverly is survived by her husband Wilbur, a daughter & son-in-law, Janet & Kerry Stricklin of Mustang; son & daughter-in-law, Kelly & Connie Sloan of Chicago, IL; son, Mark Sloan of Okla. City; son & daughter-in-law, Scott & Brenda Sloan of Leander, TX; 11 grandchildren and one great grandchild. A private interment will be held with Memorial Services to be held at 1:00 p.m., Friday, March 11, 2005, at Chisholm Trail Presbyterian Church, Yukon, OK.